Astronomers have discovered that a huge, searing-hot planet orbiting another star is loaded with an unusual amount of carbon. The planet, a gas giant named WASP-12b, is the first carbon-rich world ever observed. The discovery was made using NASA's Spitzer Space Telescope, along with previously published ground-based observations. "This planet reveals the astounding diversity of worlds out there," said Nikku Madhusudhan of the Massachusetts Institute of Technology, Cambridge, lead author of a report in the Dec. 9 issue of the journal Nature. "Carbon-rich planets would be exotic in every way -- formation, interiors and atmospheres." It's possible that WASP-12b might harbor graphite, diamond, or even a more exotic form of carbon in its interior, beneath its gaseous layers. Astronomers don't currently have the technology to observe the cores of exoplanets, or planets orbiting stars beyond our sun, but their theories hint at these intriguing possibilities. The research also supports theories that carbon-rich rocky planets much less massive than WASP-12b could exist around other stars. Our Earth has rocks like quartz and feldspar, which are made of silicon and oxygen plus other elements. A carbon-rich rocky planet could be a very different place. "A carbon-dominated terrestrial world could have lots of pure carbon rocks, like diamond or graphite, as well as carbon compounds like tar," said Joseph Harrington of the University of Central Florida, in Orlando, who is the principal investigator of the research. Carbon is a common component of planetary systems and a key ingredient of life on Earth. 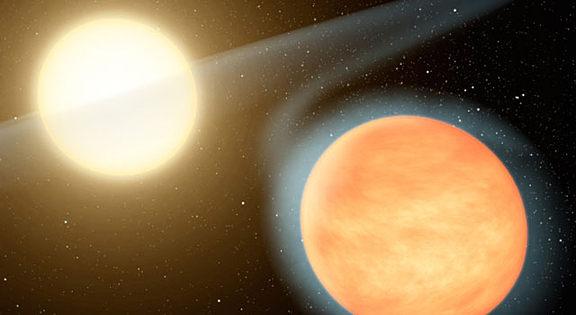 Astronomers often measure carbon-to-oxygen ratios to get an idea of a star's chemistry. Our sun has a carbon-to-oxygen ratio of about one to two, which means it has about half as much carbon as oxygen. None of the planets in our solar system is known to have more carbon than oxygen, or a ratio of one or greater. However, this ratio is unknown for Jupiter, Saturn, Uranus, and Neptune. Unlike WASP-12b, these planets harbor water -- the main oxygen carrier -- deep inside their atmospheres, making it hard to detect. WASP-12b is the first planet ever to have its carbon-to-oxygen ratio measured at greater than one (the actual ratio is most likely between one and two). This means the planet has excess carbon, some of which is in the form of atmospheric methane. "When the relative amount of carbon gets that high, it's as though you flip a switch, and everything changes," said Marc Kuchner, an astronomer at NASA Goddard Space Flight Center, Greenbelt, Md., who helped develop the theory of carbon-rich rocky planets but is not associated with the study. "If something like this had happened on Earth, your expensive engagement ring would be made of glass, which would be rare, and the mountains would all be made of diamonds." Madhusudhan, Harrington and colleagues used Spitzer to observe WASP-12b as it slipped behind its star, in a technique known as secondary eclipse, which was pioneered for exoplanets by Spitzer. These data were combined with previously published observations taken from the ground with the Canada-France-Hawaii Telescope at Mauna Kea, Hawaii. Madhusudhan used the data to conduct a detailed atmospheric analysis, revealing chemicals such as methane and carbon monoxide in the planet's atmosphere. WASP-12b derives its name from the consortium that found it, the Wide Angle Search for Planets. It is 1.4 times as massive as Jupiter and located roughly 1,200 light-years away from Earth. This blistering world whips around its star in a little over a day, with one side always facing the star. It is so close to its star that the star's gravity stretches the planet into an egg-like shape. What's more, the star's gravity is siphoning mass off the planet into a thin disk that orbits around with it. The Spitzer data also reveal more information about WASP-12b's temperature. The world was already known to be one of the hottest exoplanets found so far; the new observations indicate that the side that faces the star is 2,600 Kelvin, or 4,200 degrees Fahrenheit. That's more than hot enough to melt steel. Other authors of the paper are Kevin Stevenson, Sarah Nymeyer, Christopher Campo, Jasmina Blecic, Ryan Hardy, Nate Lust, Christopher Britt and William Bowman of University of Central Florida, Orlando; Peter Wheatley of the University of Warwick, United Kingdom; Drake Deming of NASA Goddard Space Flight Center, Greenbelt, Md. ; David Anderson, Coel Hellier and Pierre Maxted of Keele University, United Kingdom; Andrew Collier-Cameron of the University of St. Andrews, United Kingdom; Leslie Hebb of Vanderbilt University, Nashville, Tenn.; Don Pollacco of Queen's University, United Kingdom; and Richard West of the University of Leicester, United Kingdom.